I came across this Senior's Guide to Metabolism book at our local YMCA book sale and it's packed with great information for healthy living. While metabolism can slow down as we age, there are many recommendations to combat the belly fat that comes with it and can cause many health problems including dementia, heart disease and high blood pressure. To lose one pound a week you will need to cut back 3,500 calories (500 per day) but instead of reducing the whole amount by food, strive for lowering your calorie intake by 250 per day and burn 250 with exercise. or whatever combination works for you. Note: Most recommendations are for women to stay above 1200 calories per day. American Cancer Society calorie calculator. Note: My Fitness Pal, a free app, will calculate exercise and calories and show you a recommended daily calorie amount. It's easy to use and will also let you know the daily food nutrition value. While the book suggests watching no more than 10 hours of television per week, it also has chair exercises you can do during those hours. If you are over 65 and on a supplemental Medicare Plan see if you are covered by the Silver Sneakers program. You will be able to attend many programs at either a local gym or YMCA free of charge. 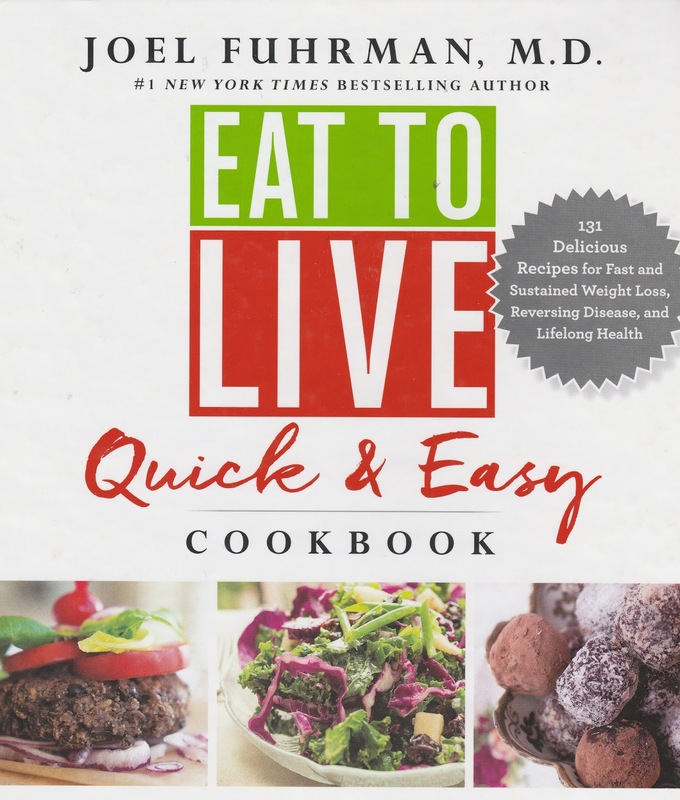 Eat to Live Cookbook, Joel Fuhrman, M.D. Joel Fuhrman, M.D. recommends a vegetarian and nutritional diet with using meat only to enhance the flavor, not the main part of a meal. His cookbook has many delicious dishes (I found a copy at our local library). He suggests avoiding food with no nutritional value: sugar, sweeteners, honey, agave nectar, maple syrup, white flour, white rice, processed and refined foods. A large salad should be the main dish for at least one meal along with three servings of fresh or frozen fruit per day. Mushrooms, onions and tomatoes he recommends to lower your risk of cancer. Hop on over to the Joel Fuhrman site to download a free nutritional list. 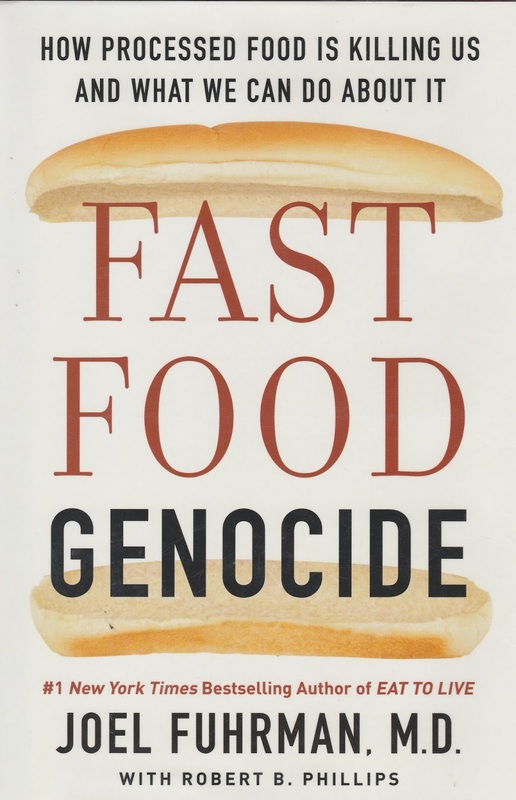 Fast Food Genocide by Joel Fuhrman, M.D. I've been reading a lot about Joel Fuhrman's suggestions for a nutritious diet (he also has programs scheduled on PBS television). 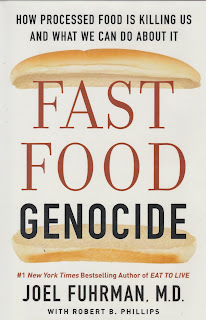 Fast Food Genocide is a wake up call for those who survive on fast food which covers not only food chains but any food that is factory made and commercially baked and is not only devoid of nutrients but contains added toxins, artificial colors, flavors, preservatives and emulsifiers. If you're trying to make changes in your diet, I highly recommend the book which gives a sobering history of how we developed such an unhealthy diet for most Americans. He also warns about a diet high in animal products (especially from fast food chains which are breaded and fried with added chemicals and flavorings). But fast food isn't the only problem, we also have medical establishments that offer quick-fix surgery or a lifetime supply of pills instead of suggesting a simple dietary regimen that can reverse and prevent illness. Some changes, however, are being made in the medical industry with the American College of Lifestyle Medicine equipping doctors with the knowledge to provide dietary changes as a recommendation to their patients. Diet has been shown to play a part in the areas marked as Food Deserts. Crime is higher in areas where nutritious food is not readily available. Studies in prisons in the Netherlands and Britain have shown the rise and fall in antisocial behavior as a direct correlation with nutrition (added supplements showed a significant difference). A school for troubled American youth showed a positive change in behavior when the candy and soda vending machines were removed! Best super foods: Greens, beans, onions, mushrooms, berries and seeds. We have the daily ability to positively affect our lives and overall health. One thing I have problems getting enough of is protein. I rarely eat red meat and don't seem to get an adequate amount of protein from fish, chicken, eggs and beans. According to My Fitness Pal I should be eating 80g of protein a day. A friend suggested Great Lakes Gelatin/Collagen. You can add this to almost anything (even a cup of tea) with very little flavor difference. I usually add Great Lakes Collagen to my morning smoothie (11 grams of protein for 2 tablespoons). Note: I've noticed Trader Joe's has Great Lakes Gelatin in their stores. Halle Berry suggests adding collagen to your diet by boiling up bones from the butcher. 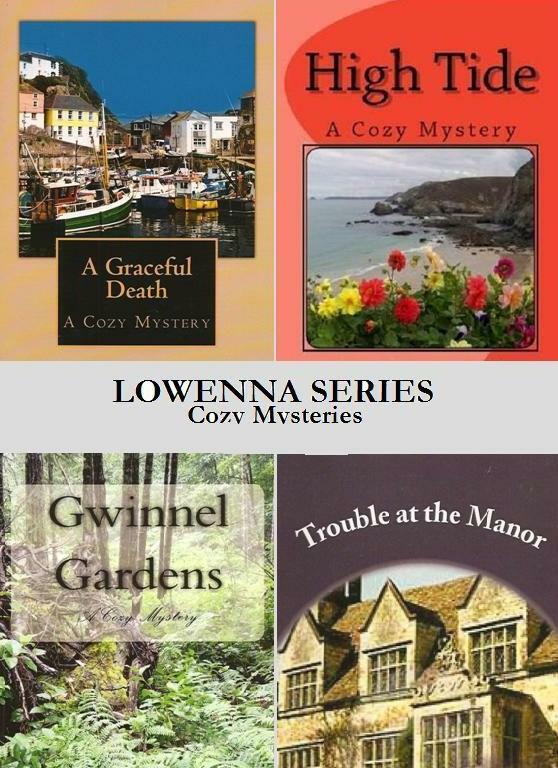 She says they will usually give them to you because they would otherwise throw them away. Boil them in water for 24 hours (add thyme, garlic and bay leaves) and drink the broth. The pharmacist suggested a brush on liquid which contained tolnaflate and as I already had athlete's foot cream containing it, decided to use that. Even if you are able to treat the fungus, usually your nail has to grow out before you see results which can take several months. Other things to take into account is diet. Eliminating sugar and minimizing gluten should help your body fight fungus and try to include anti-fungal foods: garlic, onion, coconut oil, honey, carrots. Also add probiotic foods: Kefir, Greek yogurt. Apply the infected area with coconut oil and let soak 15 minutes (add a few drops of oregano oil for extra benefit). Foot bath with one part vinegar and one part Epsom salts to 6 parts water. The Science of Eating has great tips for not only toenail fungus cures, but healthy eating. If you're counting calories (My Fitness Pal is a good way to keep track) but instead of looking at the amount you are allocated for the day, break it up into meals and snacks so that you spread the calories out, rather than finding you don't have enough at the end of the day. 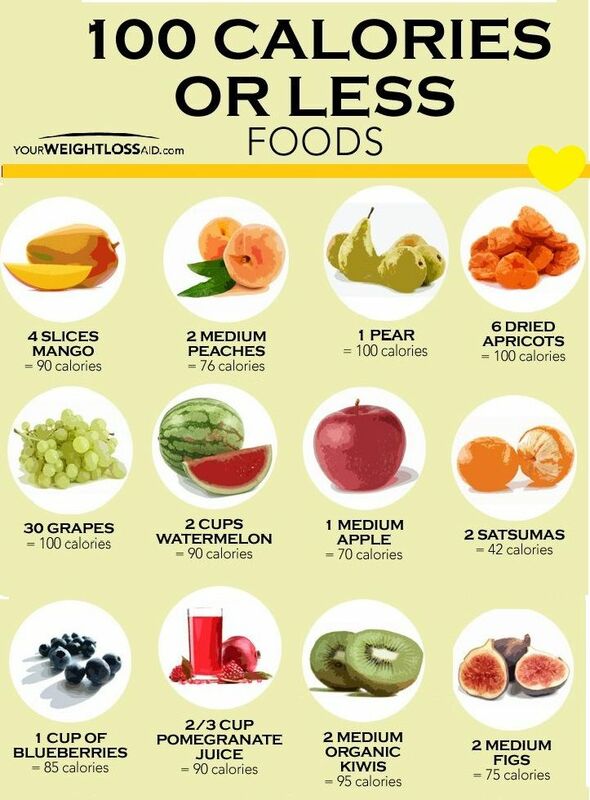 If you're planning on eating more at lunch have a lower calorie breakfast. One egg plus one egg white scrambled is just 87 calories. Throw in some frozen spinach for a nutritious meal. Note: DWLZ is a good site to find calories in both food and meals at restaurants. We often talk about fitness for our body, but our brain is just as important to take care of. While it's shown that memory loss is a given with aging, we can do a lot to improve the brain's function. According to an article in Martha Stewart, Living magazine, diet plays a big part in brain health. Include berries, leafy greens and cruciferous vegetables in your diet. Omega-3 fatty acids help to fight inflammation which can also affect the brain - fish, nuts, olives, avocados. Other suggestions are to get plenty of sleep (8 hours), limit screen time which makes concentrating difficult and exercise regularly.